Cookies are here! We're having a District Cookie Blitz on Saturday, so we wanted to spend a meeting on cookie selling. 7:45-8:`5: Create a power point or poster to advertise Girl Guide Cookies. (YaO3#2) Each leader brought a laptop for the girls to work on, plus we had two large pieces of Bristol board and a number of small pieces of poster board. We had the girls draw for if they would be working on the computer or with markers. 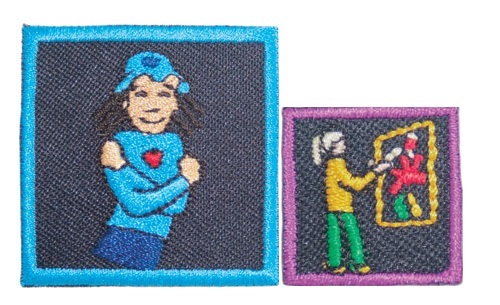 We also downloaded clip art for the girls to use from the Girl Guides of Canada site. Once everyone was done, they all showed everyone what they had created. The posters looked fantastic and we will be using them at all the locations for the cookie blitz on Saturday. The girls who did the PowerPoints did a great job too. Thanks so much!!!! Your great program ideas have helped so much. I've updated the links to the post. Enjoy!